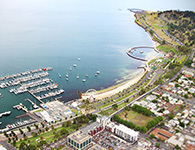 There are several reasons you might want to work part time or casually while studying in Geelong such as assisting with living expenses and gaining work experience. Most student visas allow you to work for up to 40 hours (every two weeks) during class semester time, and unrestricted hours during any scheduled course break. However, before you undertake any paid work you need to check your visa allows it. Find out more at the Department of Immigration and Border Protection website. Part-time employees works less than 38 hours per week. Employees working part-time generally work regular hours each week and receive paid annual and sick leave. Casual employees often do not have regular or guaranteed hours. Casual employees do not get paid sick leave or annual leave, so are given a higher pay rate called a 'casual loading'. Many education institutions provide a service to help students find part-time work. Deakin University and the Gordon have their own employment websites and career advice services for students. Visit Deakin Talent and The Gordon's Career Hub. Deakin also has a program specifically for international students - Deakin International Student Careers (DISC). The Jobs and Skills Centre, run through The Gordon is open to all international students, local students and members of the general community. Visit the Study Geelong Resource Page for presentations, fact sheets and information sheets to help you apply for a job and understand your job rights. Where to look for a part time or casual job? This is a virtual career shop with a live job feed to regional trending industries, and the career pathways to access them. Industries include caring professions, agribusiness, tourism, transport, advanced manufacturing, construction, education and ICT. Geelong Careers uses census data to determine skill shortages. It provides video case studies and information on study pathways to train for these jobs. It is a local, virtual career shop. Visit the Geelong Careers website for more information. Often students find work through their fellow students, friends and family. Making local friends and becoming involved in community or sporting groups and local networks will increase job opportunties. Let people know that you are looking for work and the kind of work you are looking for. The best way to find part-time/casual work is to understand where you want to work. Different businesses use different ways to recruit part-time workers. For example some cafes put a sign in their window and large retails outlets will recruit online. The Study Geelong Student Resource page has several information sheets to assist you in writing a job application and preparing for an interview. Internships are work placements for a specified time within a workplace and/or education institution. Many internships are not paid but some are. Internship experience shows commitment and initiative, which employers like. Some education institutions have services that can help you find an internship within an organisation. There are also other websites which can help you in finding internships, but there can be costs through some of these providers.